What a joy it is to connect with those in the kidlit community! I’d seen Melissa’s name as a participant in many of the challenges. I’d read her comments on blog posts. And when I discovered she had a new chapter book series launching, I knew I’d want to invite her to be my guest. Melissa Stoller is the author of the debut chapter book THE ENCHANTED SNOW GLOBE COLLECTION: RETURN TO CONEY ISLAND (Clear Fork Publishing, July 2017); the debut picture book OLIVE’S MAGIC PAINTBRUSH (Clear Fork, March, 2018); and THE ENCHANTED SNOW GLOBE COLLECTION: THE LIBERTY BELL TRAIN RIDE (Clear Fork, April 2018). She is also the co-author of THE PARENT-CHILD BOOK CLUB: CONNECTING WITH YOUR KIDS THROUGH READING (HorizonLine Publishing, 2009). Melissa is a Regional Ambassador for The Chapter Book Challenge, an Admin for The Debut Picture Book Study Group, and an Assistant for Mira Reisberg’s Children’s Book Academy. Melissa writes parenting articles, and has worked as a lawyer, legal writing instructor, and early childhood educator. She lives in New York City with her husband, three daughters, and one puppy. When not writing or reading, she can be found exploring NYC with family and friends, travelling, and adding treasures to her collections. ME: I’m so thrilled to welcome you to Picture Books Help Kids Soar, Melissa! MELISSA: First, I’m so honored to be chatting with you on your Will Write for Cookies Blog, Vivian! I’m a huge fan! You are the sweetest cheerleader for the KidLit World and I love your #50 Precious Words Writing Challenge. Also, I have benefited from your excellent critiques. I hope to meet you in person one day soon! ME: I really appreciate your kind words, Melissa…and I’m sure we will meet…maybe at a conference one day soon! ME: Who were your favorite authors/illustrators when you were a child? Oh my goodness….we are taking a slight detour from our usual picture book review because, when I heard that there was a chapter book about Coney Island, I knew I had to share it with all of you. I grew up in New York City…and Coney Island was a favorite desitination during the summer months for my family. Yup, that’s me, at about 18-months old, not a fan of the sand. These days, even younger kids are enjoying chapter books, either reading them or listening to them. If you are a fan of The Magic Tree House series, I think you will be head over heels in love with THE SNOWGLOBE COLLECTION. ordinary sleepover . . . The Adventures of Tempest & Serena: A Chapter Book Home Run! As a child, I loved books in all shapes and sizes. 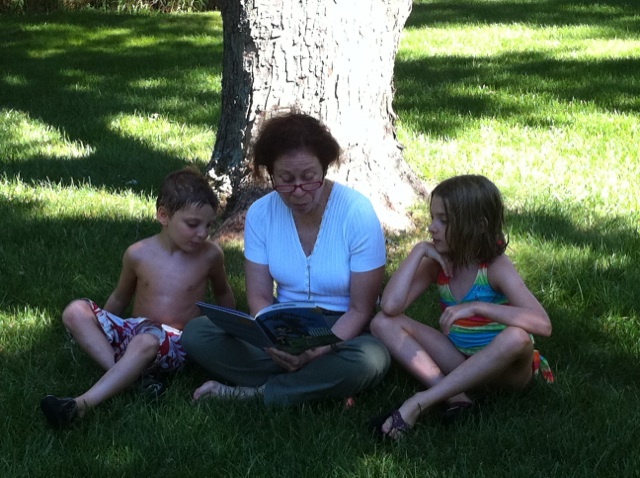 I remember the summer between third and fourth grade, I would go to the library and take out piles of books…and sit reading in the back yard…all day long! Black Beauty, Little Women, Nancy Drew…as soon as I turned the last page, I would start another book. About two years ago, there was a controversy about “chapter” books…are they replacing picture books for young children and when should parents encourage their kids to read them. I have to admit that I wasn’t quite sure what they were talking about…were “chapter” books some new electronic age phenomenon? Luckily, I met children’s author Marty Mokler Banks at a local SCBWI meeting last weekend. And now I know all about chapter books because she wrote one. And it was just published. And she graciously gave me a copy so that I could review it. And I remembered those wonderful classic stories I had read years ago…the forerunners of today’s “chapter” books. And here’s something awesome for all of you…other than my wonderful review, that is. The author is offering a FREE DOWNLOAD of The Adventures of Tempest & Serena for the entire weekend (Friday, August 24 to Sunday, August 26). Just click on the link below. I know you won’t want to miss reading it…and then you can click over to where the paperback copy is for sale on Amazon…believe me, this book is a GREAT gift for any young boy or girl…the holidays are coming sooner than you think and it’s all about encouraging children to READ! And after you read this review, I know you will want to pick up several for your children, grandchildren, nieces, nephews or any kid age 7 and up. 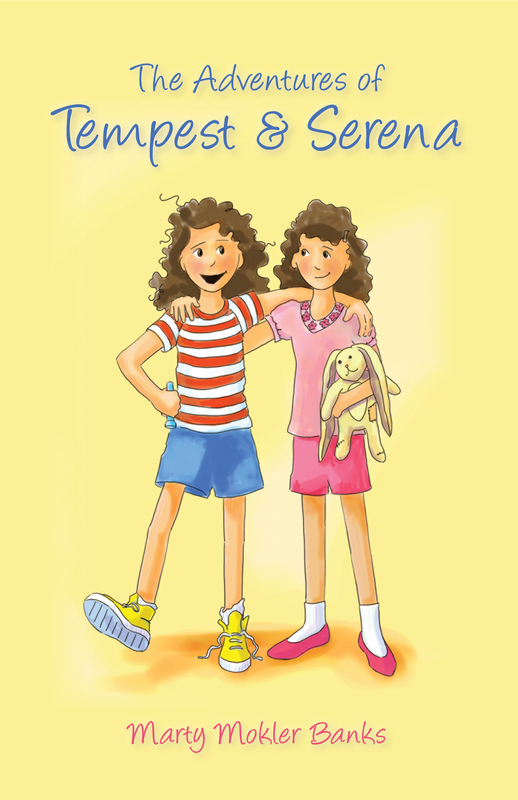 Sisters, courage, valuing one’s own strengths and qualities, friendship, bullying/teasing, magic, adventure, travel. I don’t only like this book…I love this book! It kept me turning the pages and wanting to find out what would happen next…I couldn’t put it down once I started it. A number of timely topics such as girl empowerment and bullying and teasing are addressed. In addition, the story takes us to distant lands and enables the reader to see how the various characters face their fears and conquer them. Children need great roles models and they will find them in Tempest and Serena and some of their friends. Author Banks has certainly stepped up to the plate with her debut chapter book…with The Adventures of Tempest & Serena, she has hit a homerun, right out of the park and into the hearts of her readers! The Adventures of Tempest & Serena is available on Amazon in paperback and on Kindle (http://www.amazon.com/Adventures-Tempest-Serena-ebook/dp/B008SV7UZG/ref=la_B004OB10M8_1_1_title_1_kin?ie=UTF8&qid=1345468668&sr=1-1. If you’d like to know more about children’s author, Marty Mokler Banks, you can visit her website at http://martymoklerbanks.com/index.html. 1. Please don’t forget we are accepting nominations for your favorite school or classroom to win a copy of Show Me How! All you have to do is leave a comment on one of my posts…telling which school should get a copy. At the end of September, we will select a dozen winners using Random.org. 2. On Wednesday, I watched the LIVE Google+ broadcast of The Happy Mommy Handbook with Susan Case and Katie Norris. It was lots of fun…and I joined the after-hangout chat when the program was over. I don’t know if any of you have done Google+ Hangouts…it was kind of like Skype…real-time face-to-face interaction. All three of us agreed that we’d like to do a program together…perhaps addressing the subject of bullying. I’ll let everyone know when that will happen. 3. Regarding bullying…I will be interviewed on the 9News morning show on Monday, August 27th at 8:20am (Mountain Time). If you click on their link, I think it will be able to see it…unless, of course, you are in Denver and get that channel and can watch on your TV. We will be talking about the Subtle Signs of Bullying and what steps parents can take. This is an important topic, especially with school just starting. Let’s stop bullying in its tracks! I’ll be doing an article about it next week.